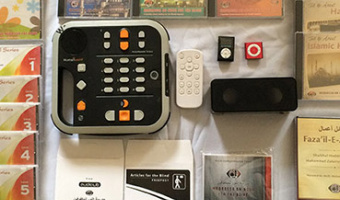 Let us show you how we produce “Talking Books” at Madrassa An-Noor for the Blind. At Madrassa An-Noor for the Blind we have a soundproof studio with state-of-the-art equipment. We produce digital Audio Books and Daisy books. Daisy Talking books are created in English and Arabic either using Human Voice or a text to speech engine that synthesizes text. Daisy Quraans have been produced in English using a TTS and in Arabic with human voice narration, both with full text and navigation points. There are many other Daisy Talking Book titles available all with the added benefit of feature rich navigation. Our books are selected by our panel of Ulama. The print books are then narrated and recorded in our studio, by trained volunteers and cover a wide range of subjects. Islamic and educational books both for adults and children are produced. New titles are continually added to our collection. Great care is taken to match a voice to a book which serves to enhance the listener’s experience. Once the book has been read, the dry audio is collected, sorted, edited through various stages using modern audio manipulation software by our sound engineers. After the editing process the Audio Book is audited against the original print. 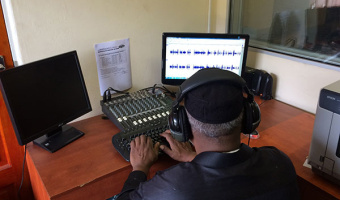 Thereafter, an audio master of the book is produced. All our masters are stored on removable media and backed up on external hard drives in climatically controlled conditions, so that a copy can be made whenever necessary. Once the master has been backed up, the audiobook is then uploaded directly onto our website where the book is available for free download by any Blind or sighted person around the world. The next step of the audio production process is duplication. The Master is placed into a CD/ DVD duplicator which produces copies at a fast rate which are then error checked by our team. After we have duplicated the media onto discs, we print and package our audio so that we may send them to all our members around the world free of charge using international freepost. 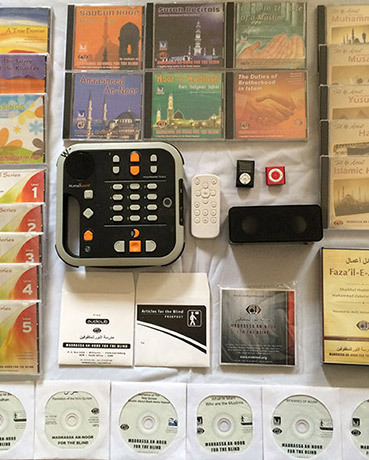 Madrassa An-Noor for the Blind also produces Daisy (Digital Accessible Information Systems) Books which is an audio book with accompanying text and is fully navigable allowing the user to increase and decrease pitch, tone and volume as well as adding bookmarks for easy reference. There are many important elements of the production process, and we humbly appeal to the public to volunteer any resource that you have even if it is your voice as this will enable us to better serve the Blind and visually impaired community and will be a source of perpetual reward for you and your family, Inshallah. 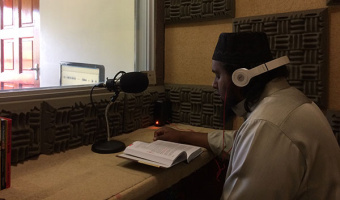 It has always been a dream of ours to convert the famous book Faza’il-e-Amaal, which was compiled with great efforts by Shaikhul Hadith Maulana Muhammad Zakariyya Kaandhlawi , into audio format for the first time in the world. Mufti Mohamed Kadwa Saheb began recording this great book on 13 April 2005. Our respected Mufti Saheb used to come to our studio to record every Friday morning without fail. After a recording was done, the dry recording would be edited by Yaseen Mahomed at the Madrassa. It was after a period of two years in May 2007 that the book was finally completed. After the entire book had been read, edited and checked against the original, it was mastered, and packaged into a five MP3 disc set. Now this vast treasure of fundamental Islamic teachings is available to you in audio format to listen to as desired.